This is an old pine floor which needed some board repairs carrying out before we could sand it. Once the repairs had been carried out we fully sanded the entire floor. Due to the original state of the floor it required a hard sand. Once the floor is clean and flat it was just a matter of grading the floor. Ensuring we had closed down the grain and it was nice and smooth. We then stained the floor to the customer's preferred colour and applied 4 coats of Junckers Hp commercial. As you can see from the pictures the floor now looks great, What a transformation. The York Tavern is located at 1 Leicester Street, Norwich NR2 2AS. If you get a chance, please visit to see our work in the flesh. Our floors withstand very heavy traffic and you will be able to see how well the floor is wearing. We undertake repairs, restoration, sanding & refinishing for all pubs & bars throughout the United Kingdom. We offer an overnight service to help keep your business running with minimal disruption. We have renovated floors up and down the country including several Wetherspoons and Slug & Lettuce pubs. Our floor coatings are some of the best in the World ensuring you have a durable solid wooden floor that will last for years. 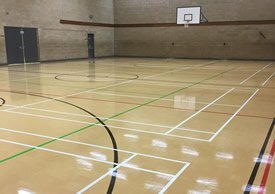 We have huge experience in the fitting & renovation of sports floors. Sports floors may be Granspung. We can perform floor sanding & repair to any wood floor. School halls have a lot of heavy traffic. They are used for assemblies, games, dining and much more. 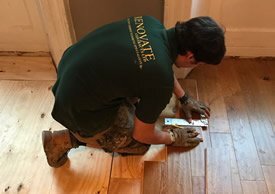 We can renovate your wood floors quickly to ensure the school operates normally. We offer a Stone Floor Cleaning service that will revive and refresh existing dirty and dull stone flooring. We have a highly skilled team of French polishers that can make your bar, doors, furniture look stunning again. Our team of fitters can lay blocks in any pattern you require. Parquet flooring is the most popular.